The temperatures are still cool here so I thought I would share one of my favorite recipes for focaccia. Several years ago, I posted a couple of recipes that use potatoes in the dough. This recipe is moist and flavorful by using olive oil, rather than potatoes. It makes a jelly roll size pan that disappears quickly. The recipe is adapted from one I learned to make at a Sur La Table cooking class with local chef Bryan Woolley. For the Dough: In a mixing bowl combine warm water, yeast, sugar, 3/4 cup olive oil, and 3 cups flour. Mix for two minutes. Place a tea towel over the mixture and let sit 15-20 minutes to rise. Then add 2 teaspoons kosher salt and 3-1/2 cups flour, adding the flour 1 cup at a time, scraping the bowl down after each addition. The dough should be soft and sticky but not liquid. Pour dough into a large oiled bowl. Cover with plastic wrap and let rise in a warm place for 1 hour. The dough should double. Pour risen dough into an oiled jelly roll pan. Spread dough to the edges and dimple the dough. Cover with a tea towel for 20 minutes and let rise. Preheat oven to 375 degrees. For the herb topping, combine 1/4 cup extra virgin olive oil and the fresh and dried herbs in a small bowl. Whisk to mix well. 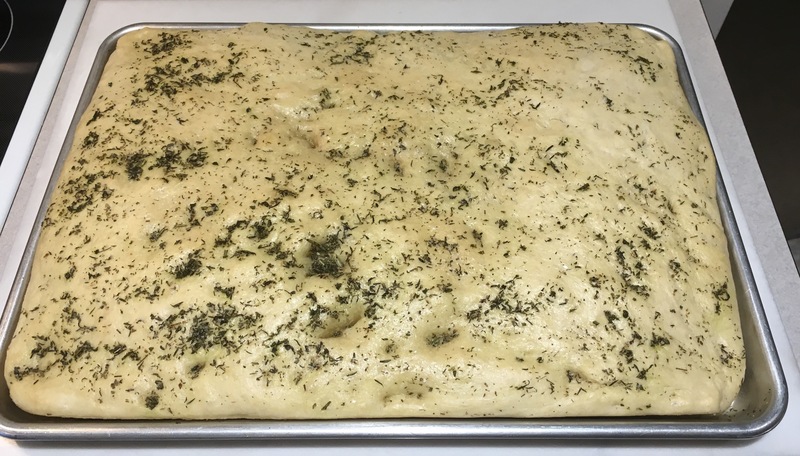 Use a pastry brush to brush the oil and herb mixture on top of the focaccia dough. Sprinkle 3/4 teaspoon kosher salt over the dough. Bake focaccia for 25 minutes, rotating the pan half way through baking. The focaccia should be very light golden. Cool on rack. Serves 12. This entry was posted in Breads, Christmas, Dairy-free, Easter, Thanksgiving. Bookmark the permalink.